With my decor arrangements, at least. I'm constantly changing things around the house just to spice things up. 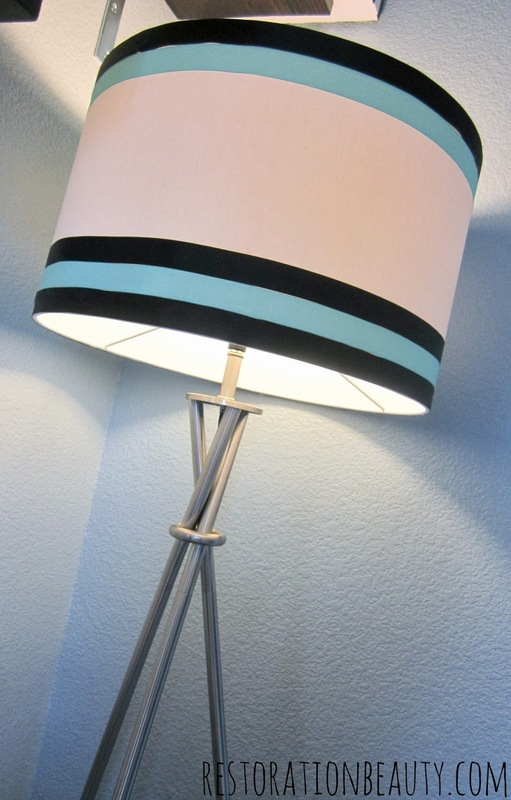 When I first bought this tripod floor lamp at Target, I loved it! You guys saw it when I revealed my office space and loved it too. By the way, thanks for the compliments, friends! But then all of a sudden, I looked at it last week and it just wasn't doing it anymore. That loving feeling had been lost. It HAD to be changed ASAP. 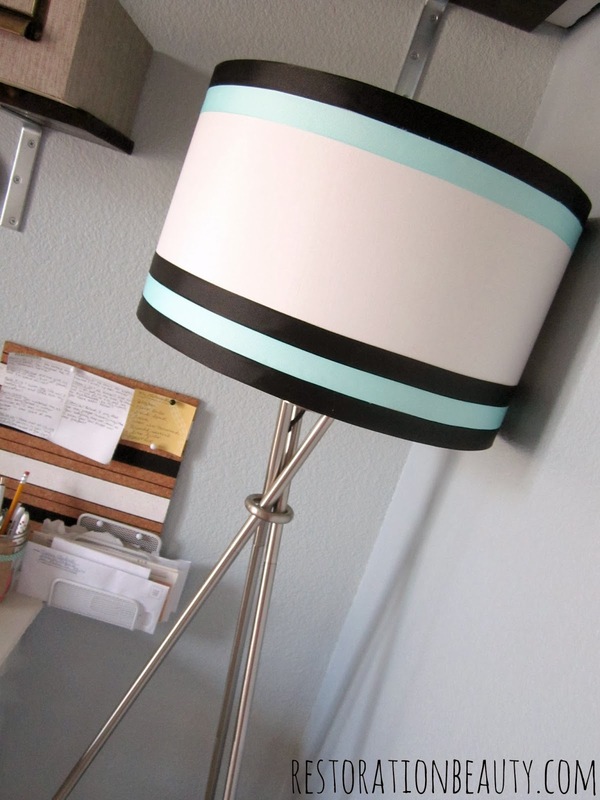 Thank God I came across Jenna's fabulous lampshade makeover she did with electrical tape! I thought that was such a genius idea to updating a lamp! I got out hubby's electrical tape (shhh) and discovered I didn't have enough. Sigh. I live in a teeny tiny town, people. We don't have stores that carry electrical tape. At least not at the ungodly hour I was attempting this project! So the next time I was in Hobby Lobby, I figured I'd just update my lamp with good ol', not outside the box, not a genius idea, ribbon! I can't get enough of the contrast between the two colors! All I used was ribbon (the blue one isn't pictured here), scissors and a glue gun! The ribbon was purchased at Hobby Lobby and at 50% off, they ran me only $2 each! The process is EXTREMELY easy! You just glue your ribbon around your lampshade! Just be cautious not to burn the crap out of your fingers! This has happened to me more times than I'd like to admit. I was originally going to just glue one strip of black ribbon to the top and bottom but kept going to see where it would take me. I'm adventurous like that. I even added some pretty Tiffany blue ribbon! It didn't take long either. It took me about 45 minutes but that's because I kept getting interrupted by a preschooler. And that's okay, I love being a mommy... and my little preschooler is pretty awesome. All in all, I'm happy with my "new" lampshade! So, no need to buy a new lampshade when you're not feeling the old one anymore! 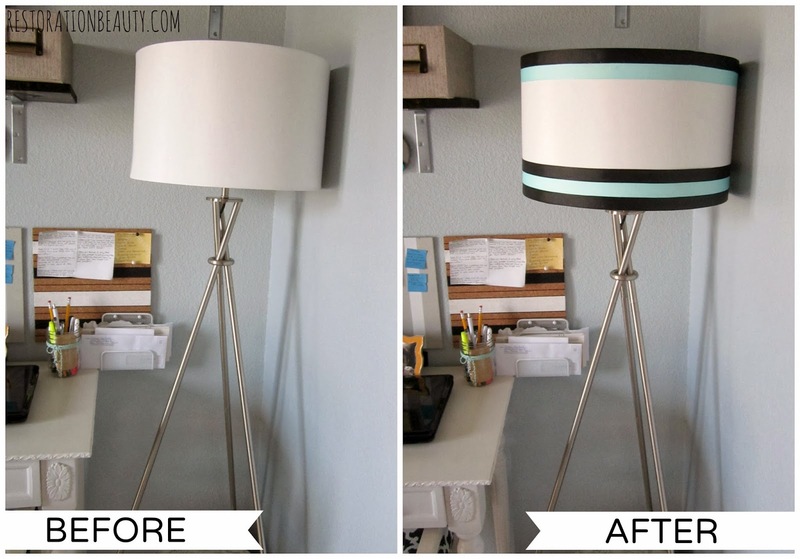 With a little ribbon, glue and a few burns later, you can give that old lampshade a nice makeover! Love the colors you chose! Perfect update Selene! Hi Selene! I found your blog and am in love! :) I could read your posts and projects all day. This is such a great way to spruce up a room...I've been staring at some lampshades I have and wondering what I could do. Thanks for such an inspiring idea! 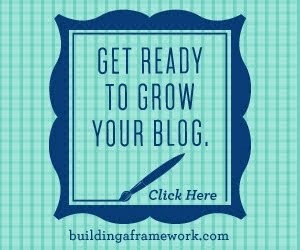 :) I'm following you on bloglovin and twitter :) Looking forward to reading more! What a great idea, Selene! And with ribbon, there are millions of colors and patterns to choose from! The colors you chose go perfectly with the lamp! Beautiful!!! Love the colors you used. Thanks, Lena!! YES, Hobby Lobby is the best!! Hi Pamela!!! 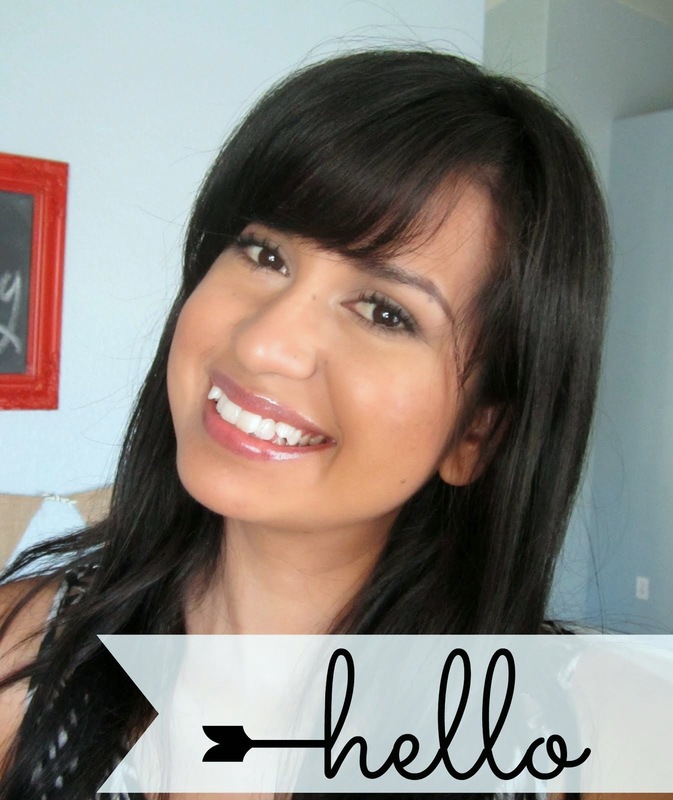 I'm so happy to hear you are loving the blog!! You are too sweet!! Thank you, Lisa!! I'm glad you like it too!! Love it - the color combo is gorgeous! Your shade caught my eye over at the Give Me The Goods Party. Love the color of the ribbon you used and it made such a great impact! Don't you love simple projects like these that restore your love for something without too much cash! Great inspiration! Come by and link up tomorrow if you get a chance at The Makers! We'd love to have you Selene! LOVE the lampshade! Great colors and an easy project! Thank you, Marie!! Those colors are my favorite! Thank you Corey!! 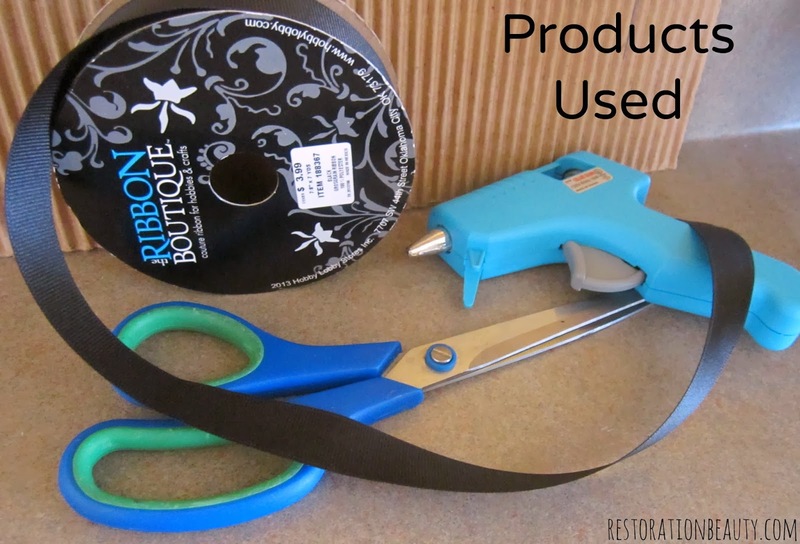 And YES, love easy and frugal projects like these! Thanks, Ashley! I'm so glad I'm not the only one! I like the contrast of the black and blue too. It's a great, quick update! Thanks for sharing! I really love how this turned out! I think not having enough electrical tape ended up being a blessing because the ribbon looks great! Stopping by from Hit Me With Your Best Shot. Thanks, Carrie!! My thoughts exactly!! Love it! 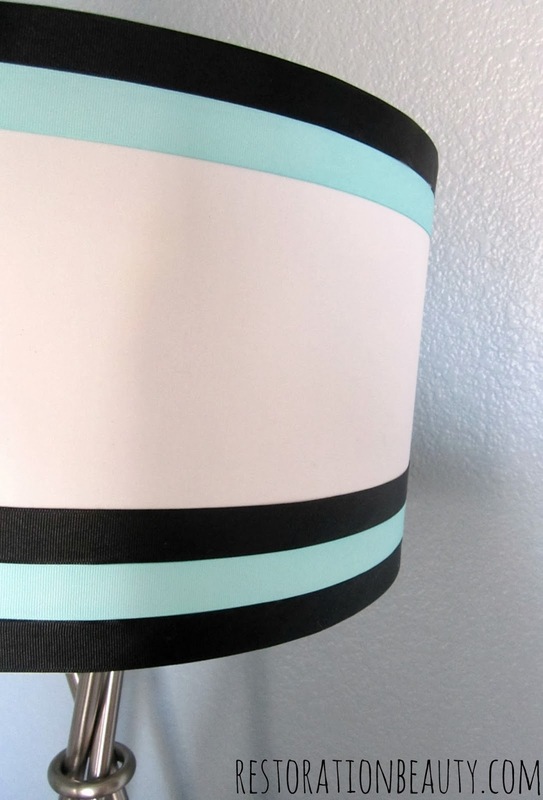 I love the colors and the stripe pattern! Hello from Pin Junkie! Thank you, Julie! They really are such a great combo! Have fun redoing your shades! Beautiful! 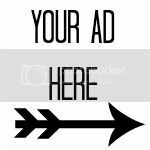 I am featuring you today at Work It Wednesday! Have a great week! Thanks a bunch, Aniko!!! So happy to hear that! This is such a cute idea! I just bought a ton of ribbon that I could use for this! Thanks, Haley!! I hope you give it a try!! It's so easy yet makes such a difference! 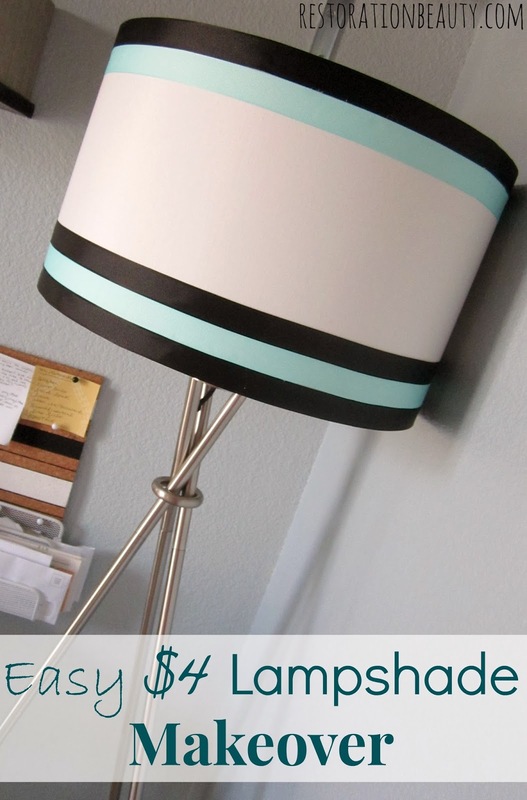 Love this lamp idea! I've had a set of lamps/shades for literally years sitting in a closet because the white shades don't match the room they are meant for. I'm not creative myself, but I can copy the crap out of your idea, thanks! PS you are my people. I want to change my decor (Ikea hacks are the best) all the time. In fact, I just discovered a show called Flea Market Flips. This show is my husband's worst nightmare!